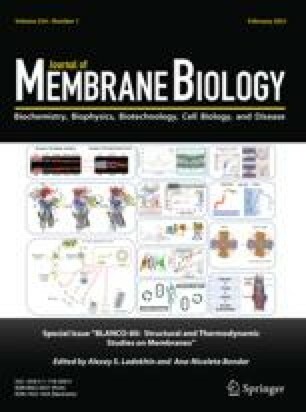 The gigaohm seal technique was used to study ion permeation through acetylcholine-activated channels in cell-attached patches of the extrajunctional membrane of chronically denervated, enzyme-treated cells from the sartorius muscle of the toadBufo marinus. The most frequently occurring channel type (>95% of channel openings), provisionally classified as ‘extrajunctional,’ had a chord conductance of approximately 25 pS under normal conditions (−70 mV, 11°C, Normal Toad Ringer's). The less frequently observed channel type (<5% of channel openings), classified as a ‘junctional’ type, had a conductance of 35 pS under the same conditions, and a similar null potential. In many patches, a small percentage (usually <2%) of openings of the extrajunctional channel displayed a lower conductance state. The shape of theI–V curves obtained for the extrajunctional channel dependend on the predominant extracellular cation. For Cs and K, theI–V curves were essentially linear over the voltage range +50 to −150 mV across the patch, suggesting that the potential independent component of the energy profile within the channel was symmetrical. For Li, theI–V curve was very nonlinear, displaying a significant sublinearity at hyperpolarized potentials. Both an electrodiffusion and a symmetrical uniform four-barrier, three-site rate-theory model provided reasonable fits to the data, whereas symmetrical two-barrier, single-site rate-theory models did not. For the alkali cations examined, the relative permeability sequence wasPCs>PK>PNa>PLi—a “proportional” selectivity sequence. This was different from the single channel conductance sequence which was found to beγK>γCs>γNa>γLi implying that ions do not move independently through the channel. The relative binding constant sequence for the channel sites was found to be a “polarizability” sequence, i.e.,KLi>KCs>KNa>KK There was an inverse relationship for the cations examined. Under conditions when the single-channel conductance was relatively high, the conductance at depolarized potentials was lower than that predicted by both electrodiffusion and rate theory models, suggesting that there was a rate-limiting access step for ions, from the intracellular compartment into the channel.